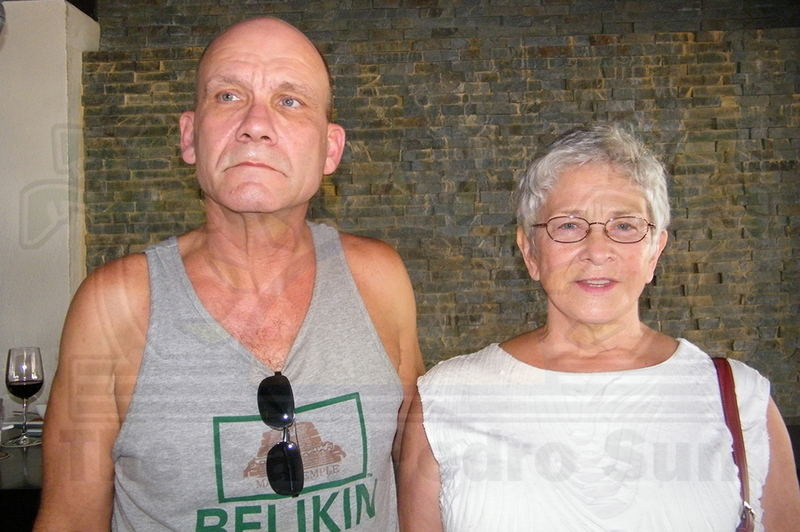 “We chose to buy a condo in Belize because we fell in love with the country,” said John Englehardt as he and his wife Cynthia detailed their bad experience with their Belizean hired attorney, who for over three years have not been able to provide them it the title to the property. The Englehardts are from Michigan, USA, and they said that they hired Arthur Saldivar, paid him over $13,000BZ, but to date has not completed his job. Even worse, they claim, is that Saldivar has been avoiding them. The frustrated couple said that they felt that their only other option was to reach out to the Belizean press to explain the bad experience in an effort to recuperate their monies back. According to the Englehardts in late 2009, they began looking to invest their hard-earned savings in a place they loved. After scouting, they decided to purchase a condo at Reef Village, paying US$115,000 in early 2010. But the coupled detailed that in order for them to legally obtain a strata title, they had to hire an attorney. 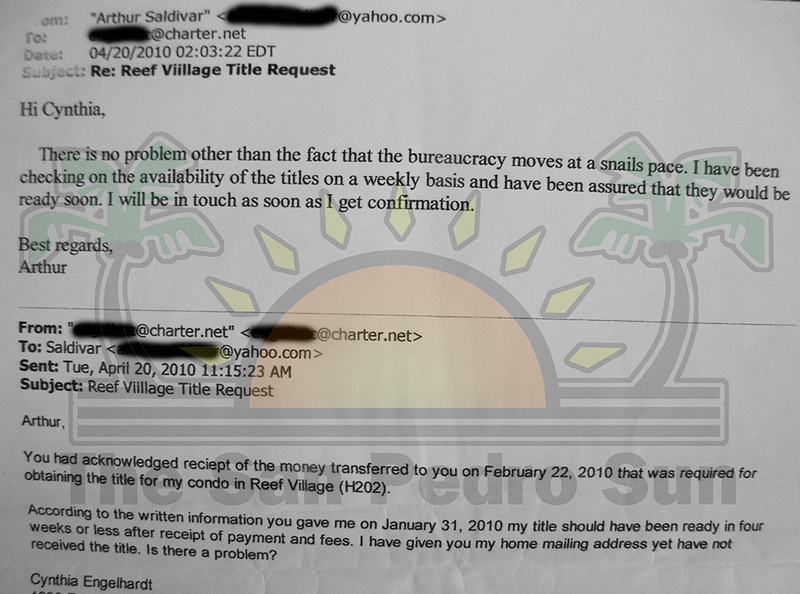 Cynthia said that she paid Saldivar in February of 2010, 1% of the value of condo and all the government fees that he had listed to complete the Transfer of Title for Unit H202 at Reef Village Resort. The San Pedro Sun understands that while Reef Village obtained payment for the condo, there is no strata plan in place, which means that clear title cannot be obtained; this is a problem that is also on-going with other homeowners who are affected. And while that is yet another hurdle the Englehardts will have to overcome as well, Saldivar explained in a Channel 7 interview on Monday January 14th that it is the Lands Department that refuses to grant title of transfer based on on-going problems at the resort. “There was a dispute between the land owner and the home owners’ association that basically developed shortly after the original strata plan was approved. When that happened, the ministry took the view that as a result of the dispute, they would actually freeze the issuance of titles. This affected a lot of people and it wasn’t a situation where there was any negligence on the part of anybody in terms of trying to get these titles. Due to that, this year or late last year, I started the process of reimbursing people because I don’t want to hold anybody’s money. I have accepted now that the lands department will not get its act together,” defended Saldivar who would not respond to the criticism that he avoided the American couple. He did confirm however that there are about eight other clients in a similar position and that all of them would be reimbursed. John Englehardt confirmed that Saldivar called him on Friday and informed him that he would be reimbursed at the end of the month. It is not the first time that Saldivar has been accused similarly. In July of 2012, retired US Attorney Richard Gentry claimed that Saldivar had defrauded him of $13,900.00 dollars which he handed to the Belizean attorney to pay stamp duty so that Gentry could get clear title for the Condo unit he was living on at Reef Village in San Pedro. But after years and there was no title forthcoming, but after taking his plight to the media, he did end up getting his refund.